I thought I'd package this year's WB DC superhero Christmas episodes together instead of doing them individually. Supergirl and Legends of Tomorrow didn't produce holiday episodes, so that leaves us with the original two: Arrow and Flash. While the previous seasons of The Flash focused on season-long plot arcs built around evil speedsters trying to kill Barry, the third is built around Savitar, an... ugh. Yeah. At least this time the evil speedster looks different. I'm going to skip the rehash of Flashpoint, the timeline-breaking event that kicked off the third season. The only part that's actually relevant is that Cisco's brother is dead now. The episode opens with a flashback to Julian discovering the artifact that turns him into Doctor Alchemy and allows Savitar to manifest (or whatever the hell is going on with that). After that, we jump the present day where Earth-3 Harrison Wells (again, I'm not going to bother) is decorating for Christmas. Meanwhile, Cisco starts seeing visions of his dead brother. 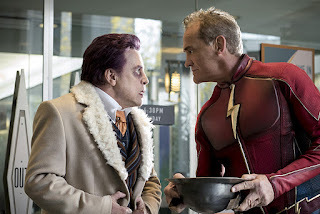 Jumping over to Earth-2, the Flash (Jay Garrick) is fighting the Trickster, allowing a reunion of the stars of the 90's series. It's a short sequence, but it's easily the best part. Barry shows up and lends a quick hand before recruiting Jay to help him with his inter-dimensional, cyber-demon problem (still not going to explain). They head back to Earth-1, where they find and apprehend Dr. Alchemy, though not before Savitar nearly kills Jay. In the process they discover Savitar can only appear when Dr. Alchemy's magic rock is open. They take it and Julian back to Star Labs and start investigating. Gradually, they realize Julian has no memory of being Alchemy, and they're able to get his assistance. But while Barry's talking with him, the fake ghost of Cisco's dead brother is convincing him to open the box, even going so far as to promise a Christmas miracle that will reunite them. Cisco caves and opens it, allowing Savitar to appear and almost kill Barry and Wally. At the last minute, Caitlin convinces Cisco to close the box, which forces Savitar out of this dimension. In an attempt to prevent him from returning, Barry and Jay hurl the magic box into the Speed Force, assuming it will be gone for good. In the process, however, Barry is briefly thrown months into the future, where he witnesses Savitar killing Iris. Jay pulls him back and tells him what he saw was just one of many possible futures and that he shouldn't go through time again. Instead of doing something drastic like telling Iris what he saw, Barry interprets the incident as a "live in the moment" sort of way. For Christmas, he reveals that he's selected and rented an apartment in both their names and that they're going to move in together, which is for some reason treated as a wonderful act of love, rather than grossly overstepping his boundaries. Oh, and everyone got Wally a super-suit: he's officially Kid Flash now (in this timeline, I mean, he was already Kid Flash in the alternate Flashpoint timeline, at least until... you know what? Just forget I said anything). On top of the decorations and obvious elements, the "ghost" motif may have been an allusion to A Christmas Carol. Same goes for the leap forward in time, which could have been a play on the Ghost of Christmas Future. As far as quality is concerned, this season has been something of a disappointment so far, and this episode's no exception. There's still a lot of fun stuff, but rather than grow or evolve, the series just keeps rehashing the same old tropes. Another speedster, more drama due to secrets and people not trusting each other, more plots centered around complications with Barry and time-travel... we've done all this already. The Flash has quite a few villains capable of supporting a season-long arc who aren't evil versions of Barry: if the series wants to stay fresh, it should try incorporating some of them. Unlike Flash, Arrow hasn't dropped substantially in quality since last season. Unfortunately, that's mostly because last season wasn't all that good. This episode is bogged down by fallout from the previous episode, a 4-series crossover with Supergirl, Flash, and Legends of Tomorrow involving an alien invasion. The Arrow episode involved a bunch of characters from that show (along with a few others) getting abducted and put into a machine that simulated an alternate reality where they were living different lives. There were a few light "It's a Wonderful Life" parallels alluded to in this episode - it's almost a shame they didn't find a way to do that as the Christmas episode. Or, you know, not tell that idiotic story at all, since it didn't move the alien invasion plot line forward in any meaningful way. This one opens with a Christmas party and concerns family. 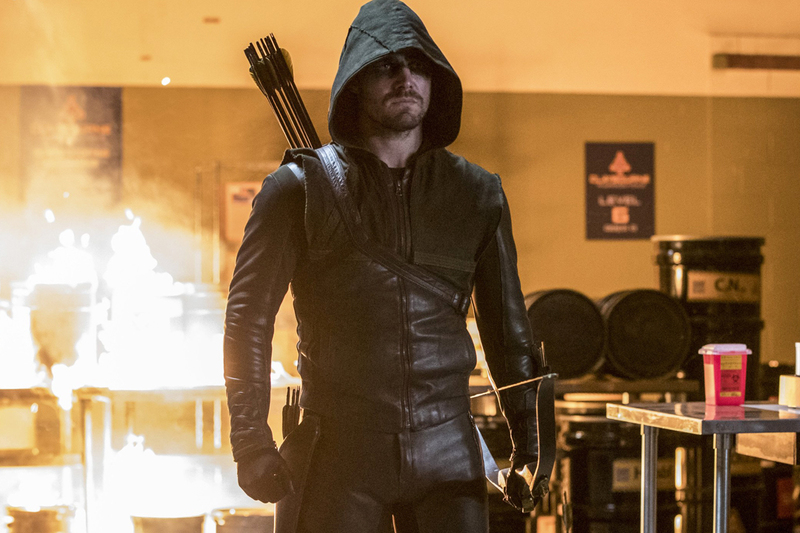 Pretty early on the new team Arrow catches up with Prometheus, only to be betrayed by Artemis, who we learned in an earlier episode is secretly working with the super-villain. We also probably get Prometheus's backstory, assuming this isn't yet another red herring. The reveal is that he's the son of a corrupt businessman Arrow killed back in his first season days. If so, this is a way less interesting origin than the one from the comics. At any rate, Prometheus also attacks Curtis, forcing him to tell his husband about his crime-fighting hobby. Then he kidnaps Felicity's boyfriend, lures Oliver into a trap, and tricks him into killing the hostage, who Prometheus has dressed in an identical super-villain costume. I guess the goal was to get Felicity to blame Oliver for the death, but she seems to understand it was Prometheus's fault here. We'll have to wait and see whether that remains the case over time. In the last few minutes of the episode, there's essentially a montage of bad things happening to Team Arrow. Curtis's husband leaves him, and John Diggle is captured by the military. Then, at the very end, Oliver finds the seemingly resurrected Laurel waiting for him. More likely, it's her evil doppelganger from Earth-2 who showed up on The Flash last season, but we'll see. They did a decent job playing up the desolation of the holidays while stripping away Oliver's connections to others and faith in himself, and there were plenty of holiday elements tossed in. Overall, this is very much a part of a longer story, and that story... is kind of annoying so far. The writers keep throwing cliched melodramatic moments against the screen, as if trying to find something that will stick. Maybe, just maybe, they should try heroic adventure for a change. It would be a nice change of pace.